UK only staff, never any junk mail & no automated calls! Get covered in less than 2 minutes... why pay more for less? 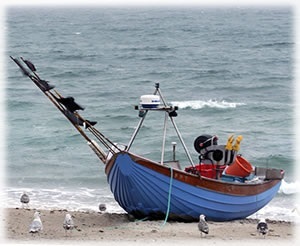 As one of our specialisms in which we know we're highly competitive, we can cater for all fishing boat models and make certain on a like for like basis our quotations always provide great value. Do I Need Fishing Boat Insurance? It’s a sensible question and since it is not a legal requirement on many waters, appropriate cover makes good sense. Firstly it'll protect your capital investment (plus if you have a mortgage on the vessel your lender may insist upon it) and secondly it'll protect against any potentially unlimited claim by a third party (e.g. for injury or damage caused by you/ your vessel). No, not in the UK, but you may need 3rd party cover to access private boatyards or marinas, alternatively is you have a boat mortgage the lender may insist upon this. Can I Buy Insurance Online Immediately? In most instances, yes. Abnormal vessel value, recent claims, vessel age above 25 years (without a recent survey), risky mooring locations and vessels undergoing major refit/ repair are the only major exceptions. More risk AND a higher vessel valuation means higher premiums. Therefore first ensure your vessel valuation is accurate! Secondly, certain factors are statistically known to increase the risk of claims: non-private/ unprotected moorings, older vessels. Inevitably also fully comprehensive insurance (i.e. covering your and the other party's vessel instead of just a single vessel) costs more. You can also option for an increased excess. Absolutely! We're confident our insurance matches anything available in our industry but we want you to be happy you're getting the best deal for you. This advice is particularly relevant if you have a high value vessel, want to insure multiple vessels or have specialist requirements. In all instances it may also well be worth giving us a quick call on 01684 564 457 if you're unhappy with your quote or policy conditions. Get Peace of Mind and Get Fishing! Whether your fishing is inland or coastal UK we'll leave you with the ultimate peace of mind. Therefore why pay more and accept less? Get yourself a quote and get fishing with peace of mind today.